"...Quick, Beautiful, Amazing! We were so impressed by Wayne and his crew, they truly are professionals..."
"...Patio Magic obviously has a strong commitment to their customers on an ongoing basis..."
"...They provided those little extras you don't expect to see anymore, and the quality of their work speaks for itself..."
Patio Magic is booking into Spring and Summer 2019. Book a quote if you would like to reserve a spot early in the year with Patio Magic! Patio Magic has been creating outdoor escapes in St. Albert, Edmonton and area for 25 years and specializes in landscape design and upscale stonework including; paving stone, mosaics, retaining wall, pond and waterfall. 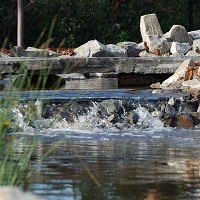 We also offer artificial turf and complete landscaping for projects with a major stonework or water feature component. Our lead installers have over 40 years of combined landscaping experience. As an industry leader in customer service, quality and design we have worked hard to set ourselves apart. We encourage you to enjoy and explore ourlandscaping portfolio albums for ideas and be sure to skim through the tips for home owners which you may find helpful. Patio Magic uses only the best quality tools and machinery. PMI Equipment supplies us with our compact equipment.